A romantic touch of color. A sophisticated update to the classic French Manicure. Every woman deserves to be lavishly adorned this Fall with a bedazzling collection of radiant gemstones and metallic shades. The gems of the world are its women and with a collection of opulent metallics and gemstones saturated with sparkle, she will look as good as she feels. 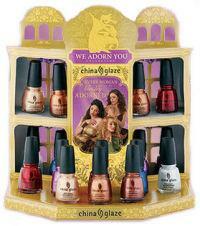 A tempting collection of six sumptuous shades that skip the guilt and go straight to the pleasure! Just when you think nobody will ever know, your secret's out and you have to have One More Merlot just to overcome the shame. It's not like you're abusing your plastic with some Retail Therapy or having a Chat Room Rendezvous with a faceless, nameless cyber Romeo. You admit that you're addicted to Venti Triple Shot Latte and that you've actually done a Strip Tease for a blundering barrista who held your coveted cafe hostage. All in all, your secret is that nature's sweetest treat is more than a sinful little excursion but it's a Chocodisiac that gets and keeps you in the mood! The Exceptionally Gifted collection is elegant, luxurious, and perfect light shades for any bride and her bridesmaids and for all stages of a wedding. Exceptional love, exceptional color. From the day he pops the question to the moment they become Mr. & Mrs. Her hands will be the center of attention. 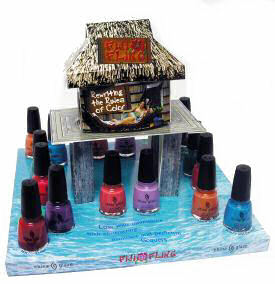 The Fiji Fling collection rewrites the rules of color coordination by pairing contrasting shades for fingers and toes, inviting individual experimentation with imaginative possibilities. Tropical shimmers and sophisticated brights encourages your clients to lose their inhibitions, relax and have fun! Paradise is in their hands. Five new shimmers and cremes. Forty percent more high shine polymers.